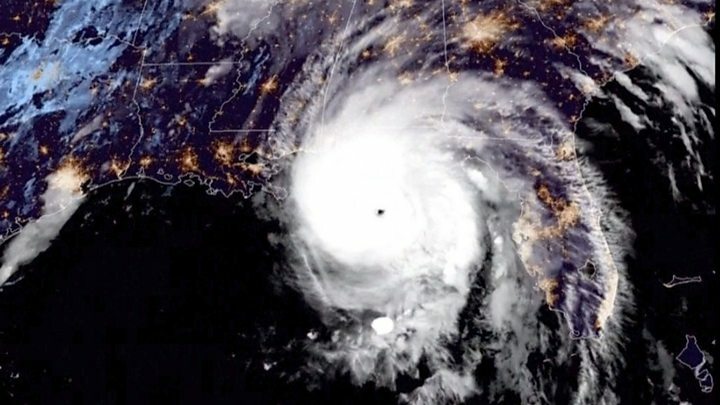 Hurricane Michael - a category four storm with winds reaching 155mph (250km/h) - has made landfall in Florida's north-west Panhandle region. 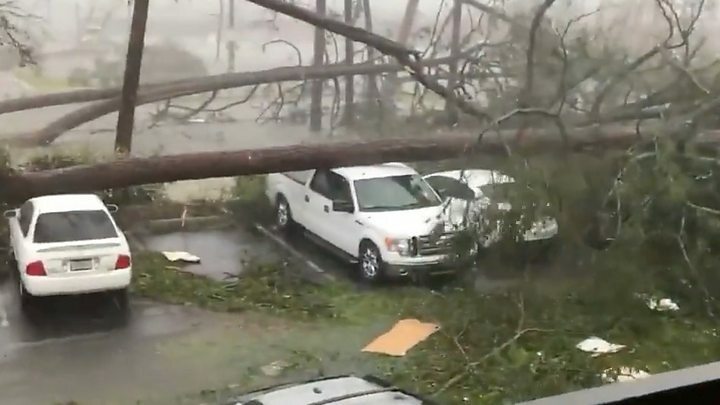 According to the National Hurricane Center, the eye of the storm touched land near Mexico Beach, Florida, on Wednesday afternoon. Hundreds of thousands were told to evacuate but many have not fled. Florida Governor Rick Scott warned of "unimaginable devastation", saying it would be the worst storm in 100 years. At least 13 people reportedly died in Central America over the weekend as a result of storm rains and floods. According to the Associated Press, six people were killed in Honduras, four in Nicaragua and three in El Salvador. 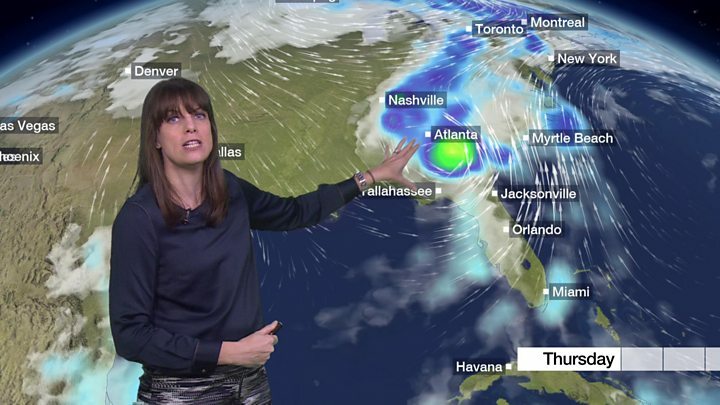 Michael is expected to move quickly up the US East Coast, dumping rains on regions that are already saturated from Hurricane Florence last month. In their latest advisory, the National Hurricane Center warned coastal residents "not to venture out into the relative calm of the eye, as hazardous winds will increase very quickly as the eye passes". More than 370,000 people in Florida have been ordered to evacuate and move to higher ground, but officials estimate that far fewer have actually left. "Do not leave your house," Florida Governor Rick Scott said on Wednesday, hours before landfall. "The worst thing you can do now is leave," he said, adding that those who do "put yourself and your family in danger". Federal Emergency Management Agency Director Brock Long told the president at the White House that he was especially concerned about buildings that were built before 2001, and are not able to withstand category three winds. "We just hope those the structures can hold up. And if not, that they're not in those structures," Mr Trump responded. Images on social media show scenes of flooding and wind damage. The hurricane made landfall at around 14:00 (18:00 GMT), according to the Miami-based National Hurricane Center (NHC). The NHC warned of a life-threatening storm surge, hurricane force winds and heavy rainfall along the north-eastern Gulf coast. It said some regions of Florida may experience storm surges of up to 14ft (4m). And "life-threatening" flash floods may occur as a result of up to 12in (30cm) of rain. 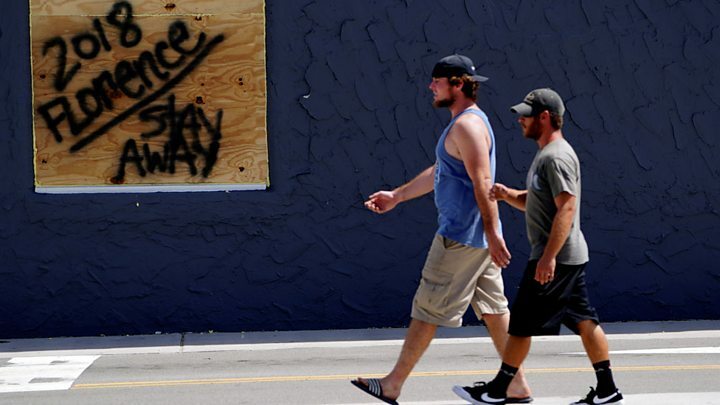 On the Saffir-Simpson hurricane scale, category four includes winds of up to 156mph with possible severe damage to even well-built homes and trees being felled. Schools and state offices in the area are to remain shut this week. On Wednesday, Gov Scott said he had activated 3,500 Florida National Guard troops. Media captionWhy do people ignore hurricane warnings? Heavy rains are forecast for the Carolinas, which were drenched by Hurricane Florence last month. North Carolina Governor Roy Cooper told residents: "I know people are fatigued from Florence, but don't let this storm catch you with your guard down." More than 300 miles of coastline are currently under threat, the National Weather Service has said. Forecasters in Alabama have warned of possible tornados. Driving through the streets of Panama City Beach this morning, there were almost no other cars on the road. Here and there the odd neon sign still glowed, but many houses and businesses were boarded up after an emergency evacuation order. Not everyone though had heeded the instruction. Dave Jackson, a man who remembers the devastation of Hurricane Andrew in southern Florida 26 years ago, has decided to stay, despite having a home just yards from the beach. His house, he says, is built to withstand winds of 150mph and it's just high enough above sea level that the predicted surge may well fall short. Just along the road, Stacey and Michael Buckner sit in their car, staring out to sea. Their house is two blocks from the water, and they've chosen not to leave because of Michael's elderly parents. For the coming hours, Dave, Michael and Stacey are on their own - the emergency services are staying out of the storm and nature is about to take its course. What cities will be hit hardest? Communities along the Florida Panhandle will feel the brunt of the hurricane first, with Tallahassee and Panama City Beach forecast to get over 6in of rain and winds that could reach at least 100mph. Utility lines are expected to be damaged due to falling trees, leading to power outages. But by Thursday, the storm will move up the coast and skies will clear allowing for "a massive wave of response and support", said Gov Scott. Southern Georgia will be hit next, with residents there warned to brace for possible flash floods. Winds will die down as Michael pushes north into the soggy Carolinas with cities Columbia and Charlotte each forecasted to see up to 5in of rain. Local officials warn people in the regions affected by Hurricane Florence last month - even those living far from waterways - to watch for landslides or flash flooding. Video How do hurricanes form?